Otro álbum de un sencillo homenaje a clásciso del progresivo... ¿sencillo? No, no lo es! Este es un discazo creado por dos super grupos japoneses como los son las chicas de Ars Nova y la gran banda Gerard (que yo dije que presentaría en este espacio) en un disco de una hora con clásicos inmortales del género interpretados con el vertiginoso estilo de estos monstruos, y de un modo asesino donde los Hammonds, Moogs, sintetizadores y teclados son interpretados de manera bestial como para romperte la cabecita, como pueden escuchar en los videos que traigo. En el próximo pueden ver la interpretación de "Four Holes In The Ground" de Premiata Forneria Marconi. Como puede ver, esta colaboración entre estas dos bandas es un homenaje a los clásicos del progresivo, pero también una nueva forma de interpretar reversiones de ELP, Trace, PFM o Rick Wakeman: esencialmente grupos que van con teclados y sintizadores al frente, el instrumento emblemático de sinfónico progresivo. Deseo rescatar este gran álbum que en progarchives está definido como recopilación de varios artistas, (Keyboards Triangle Various Artists (Concept albums & Themed compilations) Various Genres) pero que en realidad se trata de una colaboración entre el excelente grupo japonés de rock progresivo Ars Nova, y otro grupo japonés Gerard, que tiene en su haber otro gran álbum de tributos a King Crimson. Lo suyo de estos dos grandes japos es el uso intensivo de los teclados a la rock sinfónico de los 70s, y en esta ocasión el tributo va a grandes temas de agrupaciones como Emerson, Lake and Palmer ('Tarkus' y 'Toccata'), Banco del Mutuo Socorsso ('La Conquista Della Posizione Eretta'), Il Balletto di Bronzo ('Epilogo'), Premiata Forneria Marconi ('Four Holes in the Ground'), Rick Wakeman ('Catharine Parr') y Trace ('Birds Medley'). Una de portada de álbum muy melancólica, yo quiero un suéter así. Espero publicar mas de Ars Nova muy pronto. 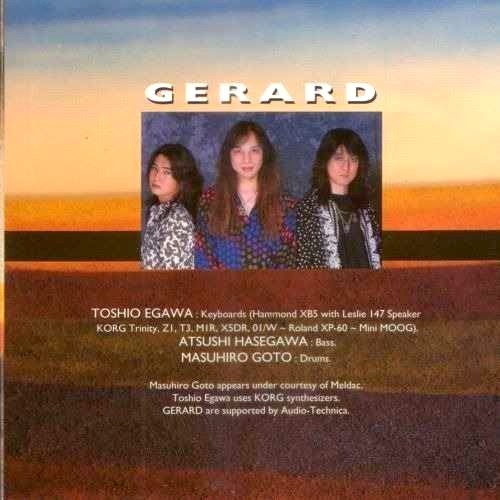 GERARD and ARS NOVA are two of Japan's main power-organ trios. They met in order to pay tribute to their biggest influences form the Seventies. The track list is great, the performances are excellent and show respect for the original pieces. 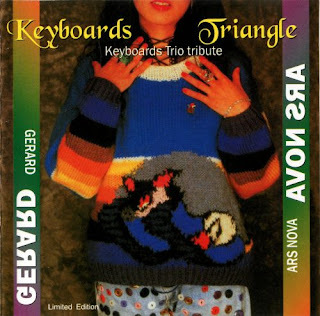 "Keyboards Triangle" was recorded in 1999 and includes three pieces by the Japanese ladies and four by the gentlemen: "Birds Medley" (TRACE), "Epilogo" (IL BALETTO DI BRONZO) and "Tarkus" (EMERSON, LAKE & PALMER) for ARS NOVA "Toccata" (EMERSON, LAKE & PALMER), "La Conquista Della Posizione Eretta" (BANCO DEL MUTUO SOCCORSO), "Catherine Parr" (Rick WAKEMAN) and "Four Holes In The Ground" (PREMIATA FORNERIA MARCONI) for GERARD. It is not only a tribute album, but also a must for all fans of this style. This album must be heard at once, as a creation of its own. Not to be missed! Prepárense, porque "Keyboards Triangle" es un tsunami de sintetizadores que les va a partir el bocho, ambas bandas usan y abusan del uso de teclados y sintetizadores de todo tipo, más toda la técnica, virtuosismo y personalidad que no deja que este disco sea un disco de homenaje sino que también es una sorprendente receración de este complejo repertorio musical de bandas progresivas de los años setenta, en una espectacular muestra de coraje y audacia, pero sobre todo de capacidad para interpretar y añadir su propia marca en canciones tan clásicas y definitorias como "Toccata" y "Tarkus" del ELP, o "Catalina Parr" de Rick Wakeman, y con resultado más que convincente y abrumadoramente satifactorio. Contra los hechos no hay argumentos, por lo tanto, es una invitación a todos aquellos que han tenido acceso a los temas originales presentados aquí a que se despanzurren de gusto con estas nuevas versiones, mientras que los gurrumetes que recién están haciendo sus armas pueden conocer un estupenda manera de aprender algo de estos clásicos en este trabajo musical que garantiza momentos grandiiosos y de un intenso viaje sin necesidad de químico alguno. This is basically a Keyboard Prog Tribute album, they do an ELP, Rick Wakeman, PFM, Trace song as well as a few others they use a little bit of artistic expression but stick to the original song pretty closely. Even with that in mind its a pretty nice tribute, and kept interesting enough to keep you listening. If you like Tributes this is one worth a few listens!! Ever since their inception in 1970, Emerson, Lake and Palmer have been a major influence on a lot of bands, especially in Italy and Japan. Two bands from the latter country, power groups Ars Nova and Gerard, have recorded a tribute album to honour some of the bands that have influenced them in their own musical careers, on which ELP figure prominently. Not only is the band represented by two songs (Tarkus, from the eponymous 1971 album, and Toccata, from 1973's Brain Salad Surgery), but the CD artwork layout is strongly reminiscent of the Tarkus album and the front cover shows a woman wearing a sweater with the Tarkus machine on it. The music was recorded between 1997 and 1999 and released by Musea in 1999. It has been very difficult to get hold of, which explains the fact that it only now appears in this review column. 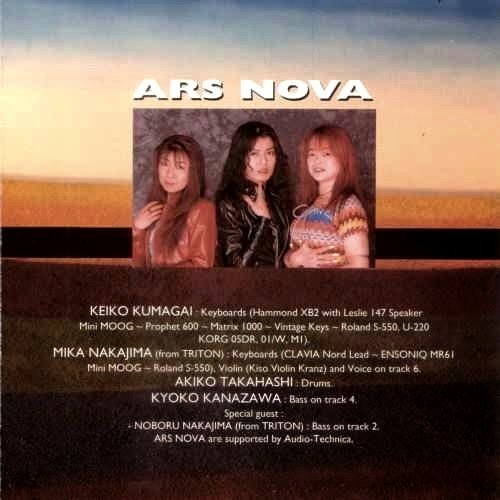 For those not familiar with Gerard and Ars Nova, I give here a short introduction: as said, both bands hail from Japan, but the comparisons don't end there. They are both trios, female in Ars Nova's case and male in Gerard's case, and play keyboard dominated music in the vein of Emerson, Lake and Palmer. The bands' line-ups resemble those of ELP, with the exception that there is no "Greg Lake", i.e. no combined bassist/vocalist: Ars Nova's music is completely instrumental, Gerard occasionally uses a session vocalist. Additionally, Ars Nova doesn't have a bass player at all, instead there are two keyboard players. In the studio they are sometimes assisted by outside bass players. Ars Nova have recorded four studio albums with original material, of which Goddess of Darkness is a good introduction. 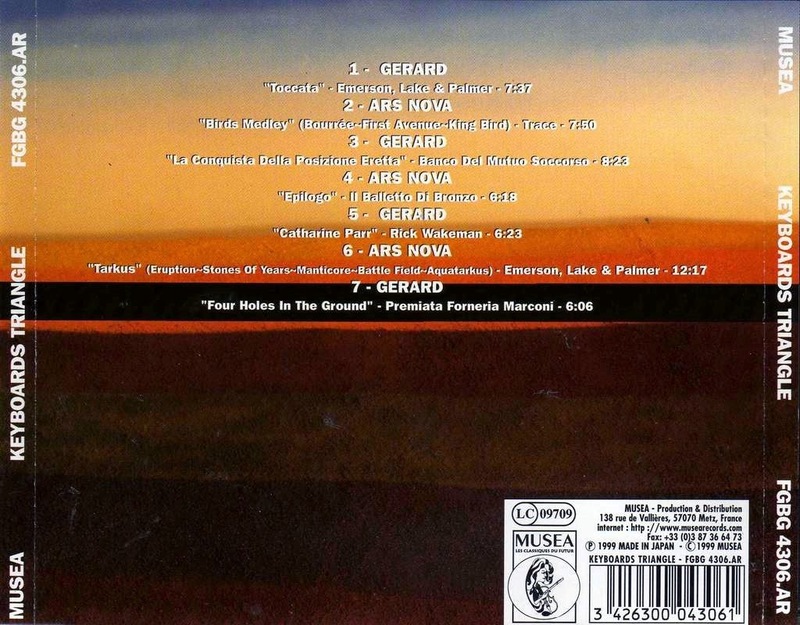 Gerard have also released several albums, of which I sadly know only one, the 1998 version of Meridian. The subtitle of the album is Keyboards Trio tribute, which could either signify the Ars Nova and Gerard, or the band whose music is represented here. The former seems more likely, since of the bands represented only two feature this keyboard-bass-drums line-up, those being Emerson, Lake and Palmer and The Netherlands' own Trace. The remaining three bands (which are all Italian), Banco del Mutuo Soccorso, Il Balletto di Bronzo and Premiata Forneria Marconi all have more or less traditional prog rock line-ups, including guitar players. Sadly enough, I don't know any of these Italian bands' music, but I suppose it must be at least keyboard oriented. Finally, there's Rick Wakeman, and he's off course a one man band. Even though neither of the two bands play their own music their styles are still easily identifiable, and while not very dissimilar from each other on a grand scale, there are some strong differences. The choice of which tracks to cover by what band was undoubtedly influenced by the two groups' individual preferences. Most notable of where Gerard and Ars Nova differ is that Gerard's approach is more aggressive. A good example is Banco's La Conquista Della Posizione Eretta, which is fast and furious, with low piano chords, a sawing synth lead and heavy bass. Arsnova's style is more melodious, as portrayed in the beautiful Bird's Medley (Trace). But, to make things confusing, Gerard is perfectly capable of delivering more laid back and melodious music (last part of La Conquista) while Ars Nova perfectly know how to tear out and be loud (Il Balletto di Bronzo's Epilogo). To summarize, this record is just some delicious power keyboard twiddling by two technically very proficient bands, and with compositions by artists as reputed as ELP, Trace and Rick Wakeman, one can hardly go wrong, and Gerard and Ars Nova have done them justice. 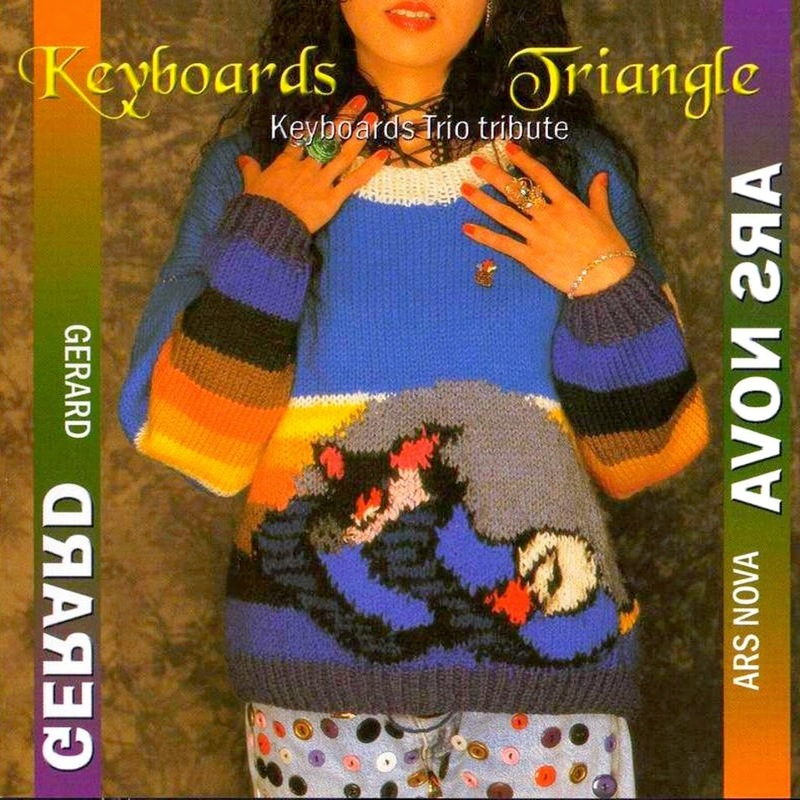 Keyboards Triangle were a one-off collaboration between Japanese keyboard trios Gerard and Arsnova (or Ars Nova), although the bands didn't actually play together on their sole album under this banner, 1999's Keyboard Trio Tribute. The project's entire raison d'être, for better or worse, was to record their own versions of keyboard-heavy prog classics, from both trios and larger lineups, with an unfortunate (but expected) emphasis on the overblown works of Emerson, Lake & Palmer. If any of the titles aren't familiar to your good self, the pieces tackled are ELP's Toccata (from Brain Salad Surgery), Trace's Birds Medley (Birds), Banco (del Mutuo Soccorso)'s La Conquista Della Posizione Eretta (Darwin! ), Il Balletto di Bronzo's Epilogo (YS), Rick Wakeman's Catherine Parr (The Six Wives of Henry VIII, of course), ELP's Tarkus (Tarkus, obviously) and PFM's Four Holes In The Ground (L'Isola di Niente/The World Became the World). So; are they any good? Well, with source material as strong as this, both bands would have trouble cocking it up too royally, Arsnova giving us a blinding version of the mighty Trace's Birds Medley and actually improving on Tarkus by playing it instrumentally. Gerard are particularly overblown, but in a reasonably good way, although they slightly overdo it on Four Holes In The Ground. Both bands use 'Tron samples: Gerard's Toshio Egawa adds samplotron flutes and strings to La Conquista Della Posizione Eretta, giving us a taste of how Banco might have sounded using a Mellotron, choirs on Catherine Parr (wrong chords, guys) and strings on Four Holes In The Ground, while Arsnova's Keiko Kumagai adds rather grungy strings to Il Balletto di Bronzo's Epilogo. The Japanese seem to be keen on this kind of thing (see: Kings' Boards), so it comes as no great surprise that there was a second volume, performed by Gerard alone, although it appears to be Mellotron sample-free. As far as Keyboard Trio Tribute goes, if you're into either of the contributing artists, you can't really go too far wrong, unless you see absolutely no point in hearing them cover existing material. La diversión está más que garantizada desde la primera a la última pista, recreaciones fantásticas en la unión de la buena música con dos muy buenas bandas que los van a sorprender en cada canción. Créanme, este disco es imperdible... ultra recontra recomendado. Aquí tienen, parte del mejor rock progresivo sinfónico de todos los tiempos, vivito y coleando en el blog cabezón. Che locati, tengo "The Pendulum", "Pandora's Box" y "The Ruins of a Glass Fortress". Digo... por si te interesan. Moe, podrías resubir los links por favor..